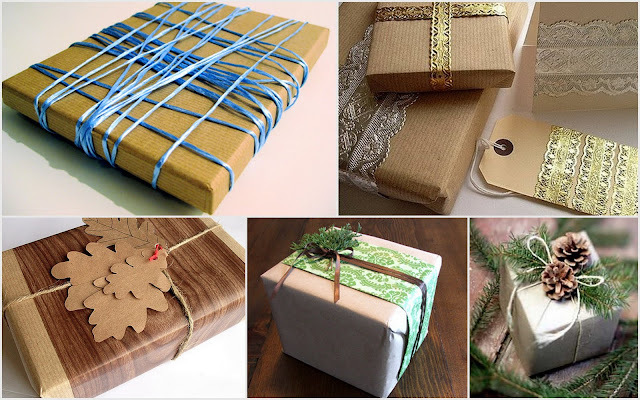 purplehomes: Watch out for my guest post on the key bunch : Wrap them up !! Watch out for my guest post on the key bunch : Wrap them up !! "I was pleasantly surprised and happy to get an “email id please” request from the very creative Sharon of the Key bunch. And happier, when she asked me write a Guest Post for her awesome blog. Why?? The key bunch is one year old, that is why!!! Congratulations to both Sharon and Rekha for writing such a lovely blog and making us wait eagerly for new posts. This is indeed one of my all time favorites, I am very partial to brown paper…yes the same one that kids use to cover their notebooks. Tie a string around it, a shimmery ribbon, throw in some dried leaves and pinecones and any box would look great. 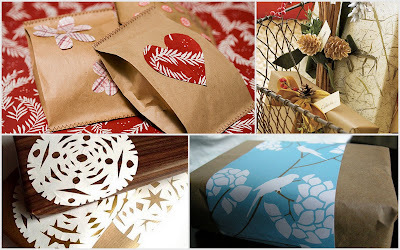 Wrap up some patterned paper on it or simply paste paper cuts outs…the dreary old brown paper suddenly comes to life. Another idea that helps us go green is to use old newspapers, books that you are planning to discard, glossy magazine sheets that anyways you are going to give away. 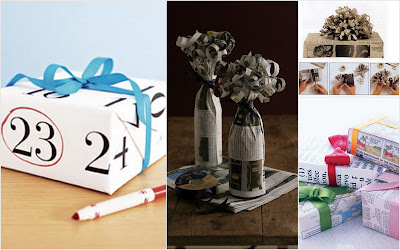 Tie a bow made up bright ribbon or simply make loads of tiny spirals of the newspaper to give the gift a life. I have to admit out of all these I have a special fondness for the calendar idea where I can wrap up the gift in an old calendar sheet and mark out the special date. Sweet. What can be better than giving two gifts than one…wrap up the gift with a silk scarf or a cotton napkin. 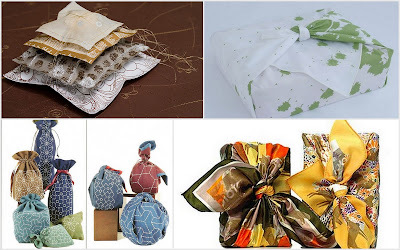 Get some tiny potlis or simply stitch pretty pouches to gift jewellery. 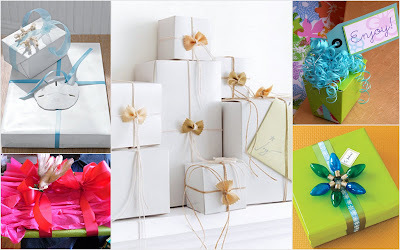 Your loved ones will cherish both the gift and the gift wrap for a long time to come. Embellishments definitely make the plain and boring wraps look special. A nice little brooch, some pretty beads, shells picked up on a holiday…all look so good. I love the one with the bow shaped pasta…really that is pasta…isn’t that super cute! No festival season can be complete without a sprinkle of gold and silver. I absolutely detest the shiny gold and silver sheets…they remind me so much of mithai shops. But these here I heart! 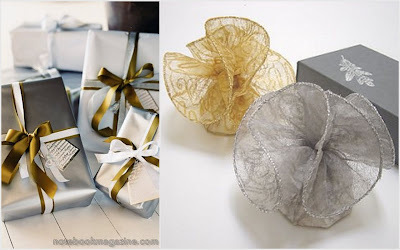 Really classy thick gold and silver paper can add a lot of elegance to a gift. I also like the pretty flowers; one can easily make these at home. Also I think it’s a great idea to paint a silver leaf on to an otherwise plain black box. 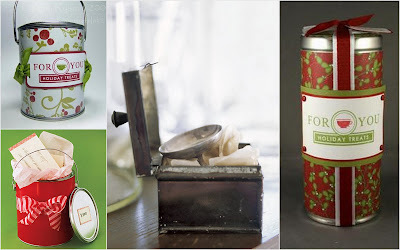 I am often ridiculed by my family because I can never make myself throw old biscuit tins, chocolate boxes, empty glass jars…I end up repainting them and using them as gift wraps. So I got really excited when I came across these pics. The old paint tin in its new avatar with all those goodies inside…doesn’t it look divine? And the old tin box…I love-love-love it. So use whatever you like, whatever you can lay your hands on…leaving you with another awesome idea I came across…twigs, pebbles, leaves...oh so gorgeous. Loads and loads of good wishes to each one of you. Have a great time celebrating!!! Patricia : Thanks...good to hear u liked it...and yes waiting eagerly for the pics...happy wrapping !! I really enjoyed your post at the Key Bunch! Hope you're well otherwise. Keep in touch. Tina: So glad the post was of some help to you. Sure will do another post soon! take care n happy gift wrapping! 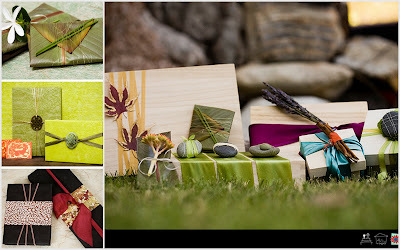 Hey such skillful, striking, top notch ideas that makes any gift outstanding. WOOOOW!!!! !